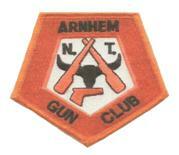 The Arnhem Gun Club incorporates several shooting disciplines including clay target shooting. The club is located in the township of Nhulunbuy on the East coast of the Northern Territory. Heading out of Nhulunbuy on Melville Bay Rd towards the airport take a left turn onto Rainbow Cliff Rd. Take the next left turn towards the gun club. The clay target grounds are on the left side. Club events are generally held on the 2nd Sunday of each month.